No matter what happens after the polls close Tuesday, one presidential candidate will be celebrating, and the other will (probably) be conceding, in New York City. The presence of both White House contenders in the Big Apple on Election Night, combined with alleged terror threats against voters, has prompted officials to heighten security and ramp up NYPD presence across the city. 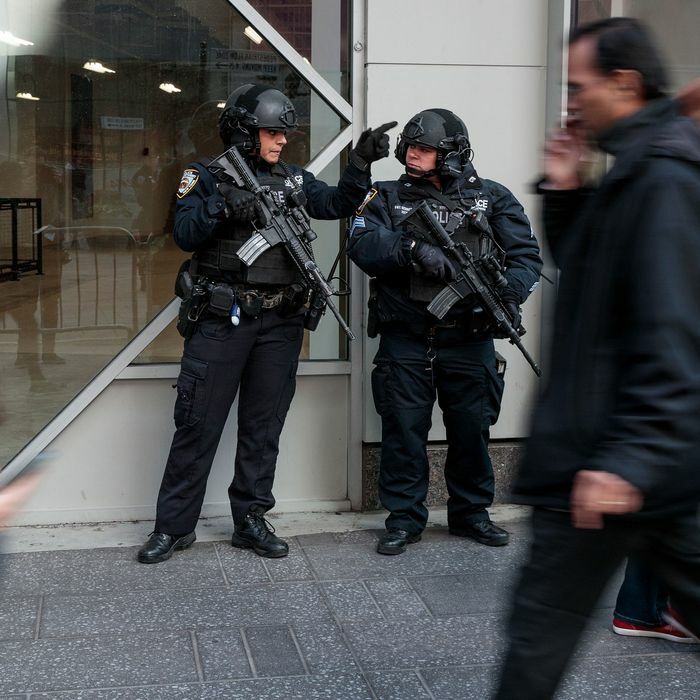 This is what that’s going to look like: More than 5,000 police deployed Tuesday, including counterterrorism squads, bomb-sniffing dogs, and plainclothes officers. The NYPD is stationing cops at about 1,200 polling places throughout the city to deter any attempts at voter suppression. The force is also prepared in case of any protests or demonstrations after the results are in, said Mayor Bill de Blasio on Monday. This is the first time two candidates have held Election Night events in New York since 1944; Clinton will be at the Javits Center on the west side, and Trump at the Hilton Hotel in midtown. Streets around both locations will be closed starting when the polls open — at 6 a.m., and there will be other street closures and restrictions around midtown to protect the candidates’ movements. (Streets around Trump Tower will also be shut down as long as the candidate is inside, reports DNAinfo.) Trump’s event is reportedly invite-only. Clinton’s event will be livestreamed and is open to members of the public by RSVP. (The invite says to expect “airport-like” security, and to leave your selfie stick at home.) And not to read too much into things, but, according to the NYPD, the Clinton campaign has reportedly canceled its plans for a potential fireworks display over the Hudson River.